"An American portrait: Mother Jones." Copyright Collection (Library of Congress), 1985. Videocassette. Atkinson, Linda. "Mother Jones, the most dangerous woman in America." New York : Crown Publishers, c1978. Summary: Traces the life and career of an Irish-born labor leader whose work began in the 1870's before the advent of strong unions and labor laws and continued for more than 50 years. Bethell, Jean. "Three cheers for Mother Jones!" Illustrated by Kathleen Garry-McCord. New York : Holt, Rinehart and Winston, c1980. Summary: Retells, from the point of view of one of the participants, the story of Mother Jones' famous children's march in 1903 made to protest working conditions for children. Colman, Penny. "Mother Jones and the march of the mill children." Brookfield, Conn. : Millbrook Press, c1994. Currie, Stephen. "We have marched together : the working children's crusade." Minneapolis : Lerner Publications Co., c1997. Summary: Examines the problem of child labor during the early twentieth century, focusing on a protest march from Philadelphia to New York City in 1903 by a group of child textile workers led by Mother Jones. Fetherling, Dale. "Mother Jones the miners' angel; a portrait." Carbondale: Southern Illinois University Press, 1974. Fetherling, Dale. "Mother Jones, the miners' angel: a portrait." Carbondale : Southern Illinois University Press, 1979. Gilbert, Ronnie. "Ronnie Gilbert on Mother Jones : face to face with the most dangerous woman in America." Berkeley, CA : Conari Press, c1993. Hawxhurst, Joan C. "Mother Jones : labor crusader." Austin, Tex. : Raintree Steck-Vaughn, c1994. Summary: Describes the life of the American labor organizer Mary Harris Jones. Horton, Madelyn. "The importance of Mother Jones." San Diego, Calif. : Lucent Books, 1996. Summary: A biography of the determined labor organizer of the early twentieth century who became known as Mother Jones. Jones, Mother. "Autobiography of Mother Jones." Mary Field Parton, editor. Chicago: C. H. Kerr & company, 1925. ___. "Autobiography of Mother Jones." New York, Arno, 1969. ___. "The autobiography of Mother Jones. Edited by Mary Field Parton. Chicago: Published by C. H. Kerr for the Illinois Labor History Society, 1972. ___. "Autobiography of Mother Jones." Salem, N.H. : Ayer Co., 1984. ___. "The autobiography of Mother Jones." Edited by Mary Field Parton. Pittston Strike commemorative ed. Chicago : C.H. Kerr Pub. Co., 1990. ___. "The Correspondence of Mother Jones." Edward M. Steel, editor. Pittsburgh, PA : University of Pittsburgh Press, c1985. ___. The court-martial of Mother Jones." Edward M. Steel, Jr., editor. Lexington, Ky. : University Press of Kentucky, c1995. ___. "Mother Jones speaks : collected writings and speeches." Edited by Philip S. Foner. New York : Monad Press : Distributed by Pathfinder Press, 1983. ___. Mother Jones speaks : collected writings and speeches. Edited by Philip S. Foner. New York : Monad Press : Distributed by Pathfinder Press, 1983. ___. "The speeches and writings of Mother Jones." Edward M. Steel, editor. Pittsburgh, Pa. : University of Pittsburgh Press, c1988. Josephson, Judith Pinkerton. "Mother Jones : fierce fighter for workers' rights." Minneapolis : Lerner Publications, c1997. Summary: A biography of Mary Harris Jones, the union organizer who worked tirelessly for the rights of workers. Kraft, Betsy Harvey. "Mother Jones : one woman's fight for labor." New York : Clarion Books, c1995. Kubicki, Jan. "Breaker boys : a novel." Boston : Atlantic Monthly Press, c1986. Long, Priscilla. "Mother Jones, woman organizer : and her relations with miners' wives, working women, and the suffrage movement. Boston, MA : South End Press, c1976. McReynolds, Janet. "The story of Mother Jones." Crawford, Neb. : Cottonwood Press, 1979. Rappaport, Doreen. "Trouble at the mines." Illustrated by Joan Sandin. New York : Crowell, c1987. Summary: Rosie and her family are caught up in the Arnot, Pennsylvania, mining strike of 1899-1900, led by the union organizer Mother Jones. Roberts, Ron E. and Carol Cook-Roberts. Mother Jones and her sisters : a century of women activists in the American coal fields. Dubuque, Iowa : Kendall/Hunt, c1998. Sproule, Anna. "Solidarity." New York : Hampstead Press, 1988. Summary: A history of three important women activists, Annie Besant, Kageyama Hideko, and Mother Jones, and their struggles in England, Japan, and the United States respectively. Terry, Megan and JoAnne Metcalf.. "Mollie Bailey's traveling family circus : featuring scenes from the life of Mother Jones. New York, NY : Broadway Play Pub., c1983. Summary: A biography of a union organizer who became known as "the patron saint of the picket lines." Workman, Nimrod. "Mother Jones' will." Somerville, MA : Rounder Records, p1978. (1 sound disc : 33 1/3 rpm). American Federation of Labor. "Records of the American Federation of Labor, 1883-1925." Microfilm reproduced by Library of Congress. Photoduplication Service from originals in the Manuscript Division, 1967-1974.172,332 items, 354 v., 341 microfilm reels. Summary: Letterpress copybooks containing correspondence of the presidents of the American Federation of Labor, Samuel Gompers and William Green. Other letters are signed by James Duncan, Gabriel Edmonston, Frank Keyes Foster, and John McBride. 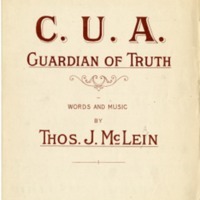 Topics include the formation of local unions, conduct of meetings, charters, bylaws, ethics, publicity, arbitration, the political principles of the American Federation of Labor, communism, socialism, American Railway Union, anthracite coal strikes of 1897, coal strike of 1902, fundraising, boycotts, United Mine Workers of America, International Association of Machinists, International Brotherhood of Teamsters, and The American Federationist (magazine of the American Federation of Labor). Includes letters to Susan Brownell Anthony, Grover Cleveland, William Hugh Johnston, John L. Lewis, L. J. McGruder, Patrick J. McGuire, John Mitchell, John Morrison, Herman Robinson, Theodore Roosevelt, Daniel Joseph Tobin, Henry White, and Woodrow Wilson. Darlington, Joseph James. "Buck's Stove & Range Co., plaintiff, vs. The American Federation of Labor, James Montgomery Beck, defendant; Samuel Gompers, defendant; and John Mitchell, defendant." New York City: American Anti-boycott Association, 1910. Glück, Elsie. "John Mitchell, miner; labor's bargain with the gilded age." New York: The John Day Company, c1929. ___. "John Mitchell, miner; labor's bargain with the gilded age." New York: Greenwood Press, 1969. ___. "John Mitchell, miner; labor's bargain with the gilded age." New York: AMS Press, 1971. Gompers, Samuel. "American Federation of Labor on Immigration ..." Washington: Government Printing Office, 1911. Gompers, Samuel, John Mitchell and Frank Morrison, appellants. (United States, appellee). "In relation to alleged contempt of the Supreme Court of the District of Columbia in the Cause Entitled The Buck Stove and Range Co., plaintiff, vs. The American Federation of Labor. S.l. : s.n., 1911? Mitchell, John. "The John Mitchell papers, 1885-1919;" accompanied by printed reel guide, edited by John A. Turcheneske, Jr. Glen Rock, N.J.: Microfilming Corp. of America, 1974. ___. "Organized labor: Its Problems, Purposes, and Ideals and the Present and Future of American Wage Earners." Philadelphia, Pa.: American Book and Bible House, 1903. ___. "Organized labor: Its Problems, Purposes, and Ideals and the Present and Future of American Wage Earners." Clifton, N.J.: A. M. Kelley, 1973. ___. "The wage earner and his problems." Washington, D.C., P. S. Ridsdale, 1913. Phelan, Craig. "Divided loyalties : the public and private life of labor leader John Mitchell." Albany, N.Y. : State University of New York Press, c1994. United States. 60th Congress, 1st session, 1907-1908. Senate. "Papers relating to case Hitchman Coal and Coke Company v. John Mitchell et al. ? Washington, D.C.: Government Printing Office, 1908. United States. Supreme Court. "Samuel Gompers, John Mitchell, and Frank Morrison, petitioners v. the Bucks Stove and Range Company. Washington, D.C.: Government Printing Office, 1911.